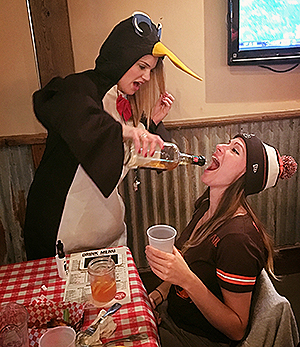 We’re the largest Cleveland Browns Backers bar in all of New York City, with over 250+ rowdy fans in attendance for the NFL season kickoff. The Big Apple Browns Backers celebrates the Cleveland Browns & NFL season at Brother Jimmy’s Murray Hill, their official Browns Backers location and the best Cleveland sports bar in New York City. Accept no imitations! The Big Apple Browns Backers are the best and largest Cleveland Browns bar in all of New York City. Come join us every Sunday to watch our beloved Cleveland Browns in what will hopefully not be another “rebuilding year.” We’ve got a large private room, food & drink specials and only show the Browns games. No other games, no other fans! Be sure to follow the Big Apple Browns Backers of NYC on Facebook, Instagram and Twitter for chapter news, photos, and videos. We also get together to host watch parties for Cleveland Indians and Cleveland Cavs post-season games.